SPOIL YOUR PRINCE OR PRINCESS ONLINE OR IN STORE! Love this carrier?…..We have more! We have carriers from only the best of Designers: From Hello Doggie to Susan Lancy to Vanderpump we have carriers that fit your luxurious fashionista style with extra comfort for your pup wherever you go. It’s not just a carrier, it’s a fashions statement, a way of life, a place for your pet to travel in luxury and comfort. The right designer carrier gives you the fashionista look you’re looking for while giving extra comfort for your best friend so they can always be right by your side and next to your heart at all times. A Teepee for your best Friend……. A Teepee is a must have for your prince or Princess giving them a luxurious bed to drift away into sweet dreams in is the icing on the cake they need. Plus they look great in your home and add a trendy style to any room. 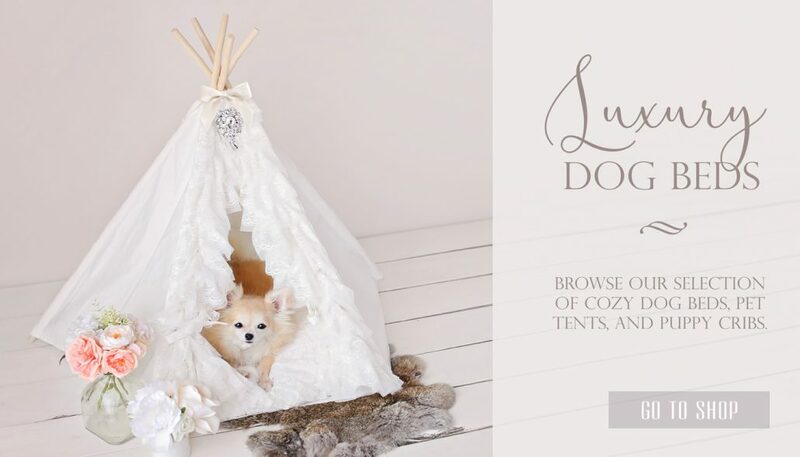 Your pet will love climbing into their Teepee bed for quiet time or to keep warm on a cold day. The Teepee has a cozy comfort feel no other bed can compare to. Handmade in the USA by Hello Doggie these Teepee beds are truly one of a kind! Available in multiple colors and all come with a comfy soft pillow bed perfect for any small breed. You can find these Teepees online or in store at Teacups, Puppies, & Boutique.